Combine the indicated ingredients to craft the corresponding item. Cutting Floss 3 Dental Floss 40 Intelligence. Flimsy Cutters 2 Files, 1 Roll of Duct Tape 40 Intelligence. Flimsy Pickaxe 1 Tool Handle, 1 Crowbar, 1 Roll of Duct Tape 40 Intelligence. Flimsy Shovel 1 Tool Handle, 1 Sheet of Metal, 1 Roll of Duct Tape 40 Intelligence. Lightweight Cutters 1 Flimsy Cutters, 1 File, 1 Roll of Duct Tape 60 Intelligence. Lightweight Pickaxe 1 Flimsy Pickaxe, 1 Timber, 1 Roll of Duct Tape 60 Intelligence. Lightweight Shovel 1 Flimsy Shovel, 1 Sheet of Metal, 1 Roll of Duct Tape 60 Intelligence. Multitool 1 Sturdy Shovel, 1 Sturdy Pickaxe, 1 Roll of Ducttape 90 Intelligence. Powered Screwdriver 1 Screwdriver, 1 Battery, 1 Wire 80 Intelligence. Sturdy Cutters 1 Lightweight Cutters, 1 File, 1 Roll of Duct Tape 80 Intelligence. Sturdy Pickaxe 1 Lightweight Pickaxe, 1 Timber, 1 Roll of Duct Tape 80 Intelligence. Sturdy Shovel 1 Lightweight Shovel, 1 Sheet of Metal, Roll of Duct Tape 80 Intelligence. Tool Handle 1 File, 1 Timber 30 Intelligence. Comb Blade 1 Comb, 1 Razor Blade 20 Intelligence, 2/5 Power. Comb Shiv 1 Comb & Use it on a wall 0 Intelligence, 2/5 Power. Cup of Molten Chocolate 1 Cup, 1 Bar of Chocolate, 1 Lighter 40 Intelligence, Instant K.O. Glass Shank 1 Roll of Duct Tape, 1 Glass Shard 0 Intelligence, 4/5 Power. Knuckle Duster 1 Roll of Duct Tape, 1 Razor Blade 60 Intelligence, 4/5 Power. Nunchucks 2 Timbers, 1 Wire 70 Intelligence, 5/5 Power. Sock Mace 1 Sock, 1 Soap 30 Intelligence, 3/5 Power. Spiked Bat 1 Timber, 1 Roll of Duct Tape, 1 Nails 0 Intelligence, 4/5 Power. Super Sock Mace 1 Sock, 1 Battery 50 Intelligence, 3/5 Power. Toothbrush Shiv 1 Toothbrush & Use it on a Wall 0 Intelligence, 2/5 Power. Whip 1 Timber, 1 Wire, 1 Razor Blade 80 Intelligence, 5/5 Power. Wooden Bat 1 Timber, 1 Roll of Duct Tape 0 Intelligence, 3/5 Power. Cushioned Inmate Outfit 1 Inmate Outfit, 1 Roll of Duct Tape, 1 Pillow 30 Intelligence, +1 DEF. Cushioned POW Outfit 1 POW Outfit, 1 Roll of Duct Tape +1 Pillow 30 Intelligence, +1 DEF. Guard Outfit 1 Infirmary Overalls, Jar of Ink 50 Intelligence, +1 DEF. Infirmary Overalls 1 Inmate or POW or Guard -Outfit, 1 Tub of Bleach 50 Intelligence, +0 DEF. Padded Inmate Outfit 1 Inmate Outfit +1 Roll of Duct Tape, 1 Book 60 Intelligence, +2 DEF. Padded POW Outfit 1 POW Outfit +1 Roll of Duct Tape, 1 Book 60 Intelligence, +2 DEF. Plated Inmate Outfit 1 Inmate Outfit, 1 Roll of Duct Tape, 1 Sheet of Metal 80 Intelligence, +3 DEF. Plated POW Outfit 1 POW Outfit, 1 Roll of Duct Tape, 1 Sheet of Metal 80 Intelligence, +3 DEF. Bed Dummy 2 Pillows, 1 Bed Sheet 30 Intelligence. Contraband Pouch 1 Foil, 1 Roll of Duct Tape 50 Intelligence. Durable Contraband Pouch 2 Foils, 1 Roll of Duct Tape 70 Intelligence. Fake Fence 3 Wires 50 Intelligence. Fake Vent Cover 2 Paper Maches 30 Intelligence. Fake Wall Block 2 Paper Maches, 1 Jar of Ink 40 Intelligence. Poster 1 Magazine, 1 Roll of Duct Tape 20 Intelligence. Candle 1 Battery, 1 Wire 30 Intelligence. Cooked Food 1 Uncooked Food & Use it on a oven 0 Intelligence. Die 1 Paper Mache, 1 Jar of Ink 0 Intelligence. Grapple Head 2 Crowbars, 1 Roll of Duct Tape 60 Intelligence. Grappling Hook 1 Grapple Head, 1 Lenght of Rope 90 Intelligence. ID Papers 1 Exotic Feather, 1 Jar of Ink, 1 Unsigned ID Papers 60 Intelligence. Key Mold 1 Wad of Putty, 1 Key (Any Color 50 Intelligence. Makeshift Raft 1 Raft Base, 1 Sail, 1 Lenght of Rope 80 Intelligence. Molten Plastic 1 Comb or Toothbrush, Lighter 30 Intelligence. Paper Mache 1 Roll of Toilet or Deluxe Toilet Paper, 1 Tube of Super Glue 30 Intelligence. Plastic Key 1 Key Mold, 1 Molten Plastic 70 Intelligence. Raft Base 2 Balsa Wood, 1 Lenght of Rope 80 Intelligence. Sail 1 Timber, 1 Bed Sheet 80 Intelligence. Sheet Rope 2 Bed Sheets 33 Intelligence. Stinger Strip 2 Nails, 1 Roll of Duct Tape 50 Intelligence. Timber Brace 2 Timbers 20 Intelligence. Unvarnished Chair 3 Timbers 30 Intelligence. Wad of Putty 1 Tube of Toothpaste, 1 Tub of Talcum Powder 20 Intelligence. Cage's Buddy (50 points) Gift the Sovereign Ring to Cage. Ladies' Man (50 points) Gift the Aftershave to Andy. Loved Up (100 points) All members of the Escape Team love you upon escaping. Soldiers Of Fortune (150 points) The Escape Team have escaped. Tanked Up (100 points) Complete the construction of the Tank. The Mad Man (50 points) Gift the Trash Bag to Sean. Cash Is King (60 points) Earn over $1000 across any of the prisons. Clean Away The Crime (20 points) Spend a total of over 20 game hours in the showers. Digging It! (60 points) Clear a total of 50 tiles using the Shovel. Disrespect My Authority (80 points) Knock unconscious a total of 50 guards. Favour Fave (100 points) Complete 100 favours successfully across any of the prisons. Grey Matters (40 points) Achieve stats over 80 for intellect. I Present To You (20 points) Give away 50 items to inmates and guards. Jobsworth (80 points) Hit quota at least once across all job roles. Let’s Get Physical (60 points) Achieve stats of over 80 for both Strength and Speed. Man On The Run (60 points) With a Guard Heat of 100, successfully evade capture until it returns to zero. Master Craftsman (100 points) Craft all the items available in the game. Naked Month (50 points) Spend 30 days in game time without wearing any outfits. Never Be Alone Again (50 points) Attend 100 visits from outsiders across any of the prisons. Punch Drunk (40 points) Knock unconscious a total of 50 inmates. 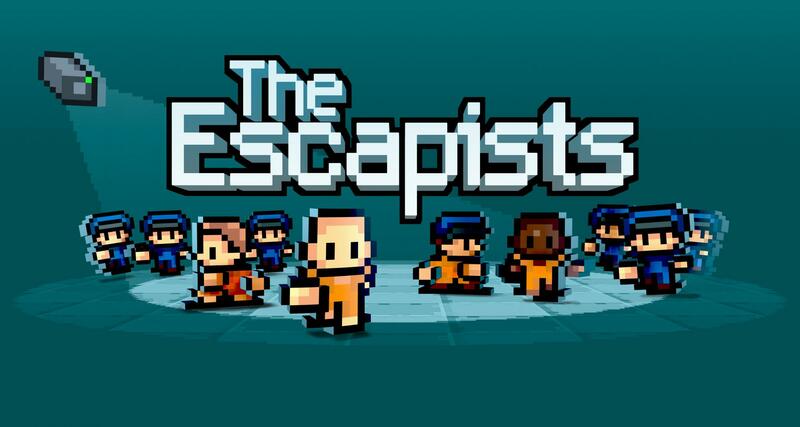 The Escapist! (150 points) Successfully escape from all six prisons. The Wet Bandit (30 points) Flood 50 toilets across any of the prisons.